I had the cunning plan to launch the book on my birthday. This might have worked, if I hadn’t also got a helping of viral friends for my birthday. But a few days later than intended, it’s go time. 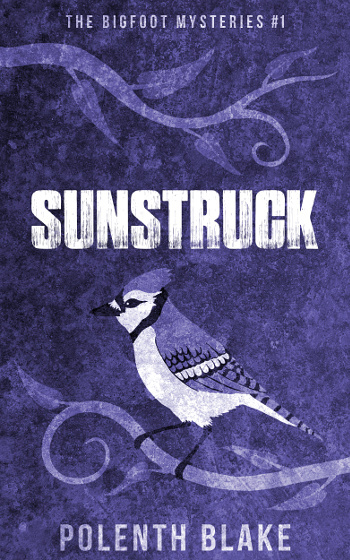 Sunstruck is an urban fantasy novel with Bigfoot. More about the book and the launch is below. The Spokane Ecology Board covers up supernatural incidents, under the pretence of enforcing environmental laws. It’s a dull job of sightseeing thunderbirds and pixie outbreaks. Until the team gets murdered. Ari is the replacement team’s Bigfoot liaison. Armed with everything she’s learned from detective shows, she’s ready to find the murderer. The downside is the job comes with a human partner, who smells of air freshener and lines up his desk like a math project. He’s only a scientist, so it’s not like he knows anything about magical crimes. Ben Cabot grew up hearing stories about Bigfoot, but they failed to mention a love of the internet or an aversion to throwing wrappers away. But there’s more out of place than an untidy work partner. Someone’s messed with the case files, and that means the killer might be closer than they think. I have a three chapter sample on my website. Some vendors also have their own samples. I always recommend reading the sample before buying. The book is currently available on Amazon US, Amazon UK and Smashwords. A comprehensive (and regularly updated) list of sellers is found on the book’s official page. The books are set in an alternate version of Spokane, Washington. They’re told from two points-of-view – Ari and Ben. The balance between the two narrators will depend on the book. 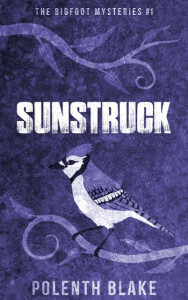 Sunstruck has more from Ari. The next book (Conduit) will have more from Ben. After that, it’ll vary. It’s an open-ended series, where each book has a stand-alone mystery (though it’ll help to read them in the right order). 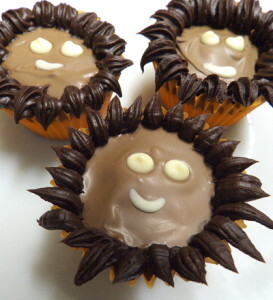 In the tradition of launch cupcakes, I made Bigfoot faces. These aren’t my most technically skilled decorating jobs, but they are very chocolatey. So, here’s to Bigfoot and launches. I hope you enjoy the book! # If you want to note it for later elsewhere, I’ve tweeted about it and have a post on Tumblr. The book also has a page on Goodreads. Update: This book is no longer available to buy as a standalone title. It can be downloaded for free from Patreon. 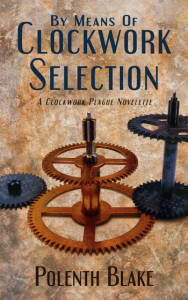 I have a new ebook out in the world – a steampunk novelette called “By Means of Clockwork Selection”. As a launch promotion, the book is available free on Amazon from 28th August to 1st September (2013). Full book details, and links to all the sellers, can be found on the official book page. Ramblings about the book can be found below. The gears on the cover come from an old clock, which I dismantled. There were other neat things in the clock, like a mechanical music movement, which may be coming to a cover near you soon. Connie survived the plague that devastated plants, animals and clockwork alike. Her life has settled into the relative peace of farming clockwork ponies and marriage to her childhood sweetheart, Bess. But the threat of plague is never far away. Mutated oaks are spreading over the ruins of London and stories of outbreaks abound. She fears the worst when a pony collapses, but the true cause is far more surprising. It might be the key to rebuilding the world. 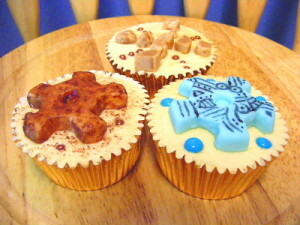 Originally, I planned to make cupcakes for big releases only. When I told the family my next book was a steampunk novelette, the response was, “Steampunk cupcakes!” So it looks like I’m making cupcakes for short story releases too. Gears were a challenge as I couldn’t find any cutters locally, so I cut circles and fashioned them into gears. There are standard gears and sky metal gears (also seen on the cover). The filler cakes have nothing to do with the story, as they were mostly an excuse for adding fudge pieces. The next thing out will be an urban fantasy novel. Until then, I hope you enjoy this book*! * If you’re of a social media persuasion, you might want to add it to Goodreads or LibraryThing. ‘Tis the season for lots of sugar, as my collection Rainbow Lights is now live on Amazon. In celebration, I made cupcakes in rainbow cases and decorated them with a rainbow of sweets. Some might notice indigo and ink are missing from my collection colours, which was due to the availability of dyes and sweets. But the family aren’t complaining, as it’s all still sugar. In less sugary information, the book is a collection of fantasy and science fiction stories and poems (mostly stories). I have an official page on my site, which has the table of contents, links to any stories available free online (you can also read the first couple with Amazon’s look inside feature) and a comprehensive list of where to buy. Currently these are Amazon’s sites in various countries, but there will be other places later. There’s also a page on Goodreads if you’d like to mark it for later, leave a review, or anything of that nature. The date I originally set was 13th May, 2013. This was great, except I’d forgotten it was my parents’ ruby wedding anniversary, and I was down to cook a meal. (I remembered the meal, but not the date.) This meant the collection was pushed on a little way, but I didn’t miss it by much. 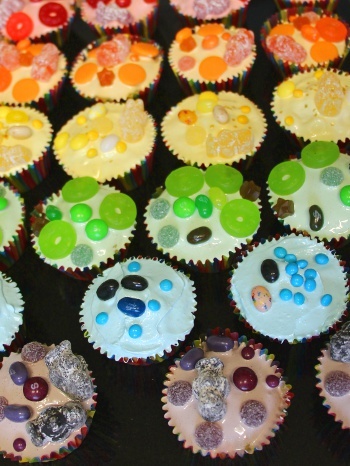 The book went live on 23rd May, and I got down to making cupcakes on the 25th. Currently the book is only available on Kindle. I’d like to get it up on Smashwords too. I also plan to make a paperback version, with charcoal illustrations inside. The paperback will take time due to the extra pictures, so I’m not setting a date. It’ll be done when it’s done. But now it’s time for me to drink tea, eat cupcakes, and start work on the next thing.